UNICEF USA presented Rotary International with its Children First Award during UNICEF’s annual gala in Chicago 6 April. Rotary and UNICEF have enjoyed a deep relationship even before they were united when the Global Polio Eradication Initiative (GPEI) was formed to rid the world of the paralyzing disease. Ending polio has been Rotary’s top goal for more than 30 years. The GPEI partners, including Rotary and UNICEF, have achieved a 99.9 percent reduction in cases of the wild poliovirus by working together to immunize 2.5 billion children. “We are getting closer to the day when polio will be eradicated from the face of the earth,” said John Hewko, Rotary’s General Secretary. “That day will be only the second time in history that a human disease is eradicated. 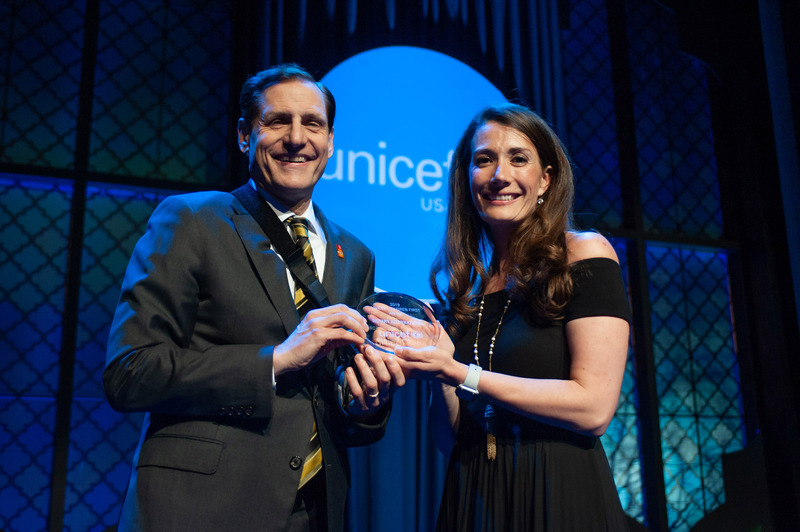 “This award is really a tribute to the perseverance of our members, and a reaffirmation of UNICEF’s and Rotary’s shared commitment to the world’s children that they have every opportunity to live healthy, safe, empowered lives,” he said. Rotary International President Barry Rassin and his wife, Esther, also attended the gala. Guests enjoyed a silent auction and raffle, seated dinner and more, including the opportunity to view Rotary’s VR film, “Two Drops of Patience” about a young Rotaractor on a mission to vaccinate children in a remote region of Uganda. The evening supported UNICEF's work in more than 190 countries and territories around the world to save and improve children's lives. The event has previously raised more than $9 million to help fund UNICEF's core programs.